If you’re traveling this holiday season, you should know what steps to take to lower your risk of developing blood clots in your legs that can cause serious, sometimes fatal, health problems. Long flights or travel by car can keep you from moving around, which increases the risk that these abnormal clots will form. However, with the right strategies, you can lower your risk and make your trip a safer one. Deep vein thrombosis (DVT) is a blood clot that forms in the deepest veins found in the legs. Signs that a DVT has formed include pain, tenderness, swelling or discoloration of the skin. These blood clots are dangerous because they can break free and travel to various organs in the body. If the clot enters the lungs, where it is called a pulmonary embolism, it can be become fatal. While some people are genetically prone to DVT, others face a higher risk because of smoking, excessive weight, hormonal treatments or recovery from surgery. Additionally, certain diseases also increase the likelihood of DVT, including cancer, metabolic syndrome, atherosclerosis, heart failure and diabetes. In general, the risk for venous thromboembolism, including DVT, increases by 2 to 4 times during long plane flights. The risk also increases during long car, train or bus rides. 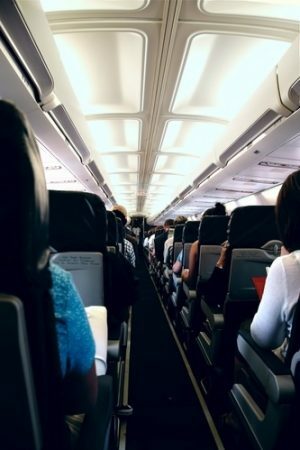 This increased risk during travel occurs because, if you sit in one position for a long time, your calf and upper leg muscles don’t contract like they do when you walk or stand, which in turn can diminish the venous circulation in your legs and allow blood to collect and form a clot. How can you prevent DVT while traveling? Stay active on the flight or ride. Research shows that blood clots are less likely to form in the legs if you keep the muscles active and moving. Get up and walk down the aisles, or perform calf muscle exercises intermittently. If you’re driving, stop and walk around a bit every few hours. Stay hydrated. Being dehydrated can lower your overall blood volume and increase your risk of DVT. To avoid this, drink around eight ounces of water every two hours. It’s also wise to limit alcohol and caffeinated beverages, which can increase the risk of dehydration. Wear graduated compression stockings if your doctor recommends them. These stockings should provide 15–30 mm Hg of pressure at the ankle. You should only wear compression stockings if your physician has diagnosed you as being at risk for DVT. If you need help learning more about how to lower your risk of DVT, talk to a personal health advisor, who can refer you to experts for proper diagnosis and treatment planning. That way, you’ll have one less thing to worry about during holiday travel. To learn more about why DVT are dangerous, and how they can be treated, click here.